Observation - Common fleabane - UK and Ireland. Description: Numerous daisy-like, bright yellow flowers and green lanceolate leaves. Given its scientific name, does it have unpleasant side-effects if eaten? 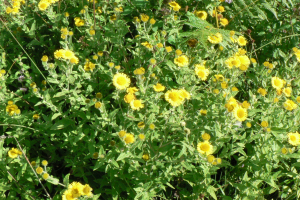 Numerous daisy-like, bright yellow flowers and green lanceolate leaves. Given its scientific name, does it have unpleasant side-effects if eaten?